Father Paul Yi has been appointed pastor at St. George Catholic Church in Baton Rouge effective July 1. Father Yi, the son of Ja and Jung Su Yi, is a native of Seoul, South Korea and a graduate of Notre Dame Seminary in New Orleans. He was ordained in 2008 by Bishop Robert W. Muench at St. Joseph Cathedral in Baton Rouge. Father Yi is currently serving as chancellor of the Diocese of Baton Rouge and pastor at Ascension of Our Lord and St. Francis of Assisi Church, both in Donaldsonville, and administrator of Our Lady of Prompt Succor Church in White Castle. He has previously served as parochial vicar at St. Aloysius Church and Our Lady of Mercy Church, both in Baton Rouge, and Immaculate Conception Church in Denham Springs. He also served as administrator at Mater Dolorosa Church in Independence and and St. Joan of Arc Church in Bayou Pigeon. 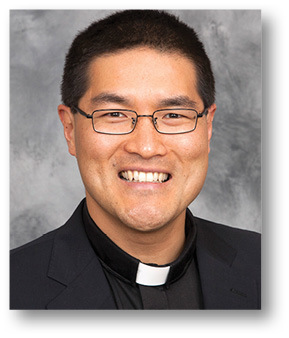 Father Yi is succeeding Father Mike Schatzle, who is retiring, also effective July 1.